You are the manager : Whether it's tactics, contracts, sponsors or stadium upgrades — determine the future and the success of your club, but don't neglect your private life! By fans, for fans : Club Manager is developed by fans with more than 20 years of experience and a passion for football. Editor on board : With the integrated editor, you can create your own teams or edit teams, players and club names that are included with the game. Getting started : Launch your career in the German league or one of four international leagues! Strategy : Comprehensive contract, training and line-up systems for your players and team. Finances : Make decisions concerning player contracts, ticket sales, sponsors and merchandising. Development : Expand your domain from a simple Sunday league football ground to a fully equipped stadium, including the relevant infrastructure. Excitement: Intervene directly in play and make tactical decisions in real time. Tactics : Whether it's parking the bus or throwing everything forward — you decide which strategy to play and for the first time can create an individual training plan for each player. Transfer market : Buy and sell players under realistic conditions, with the new renegotiation option! Goals : As the manager, you will need to strive to meet the board's objectives for the season. Tournaments : Create your own tournaments or host friendlies. Statistics : Comprehensive statistics will help you climb to the top of the league. Budding new talent : Train and foster youth players for your future success. Back-room staff : Manage your entire team of training staff and delegate tasks. Club Manager has everything that a good football manager needs: whether it's tactics, statistics, a transfer market, stadium upgrades, advertising, merchandising, developing the stadium periphery, fostering youth talent, training sessions or training camps — for the first time now also in France and Italy! Comprehensive league system : The German league and four international leagues, including numerous championships in almost 200 countries. Powerful editor: Comprehensive customisation options which also allow you to modify player and club names, including kits. 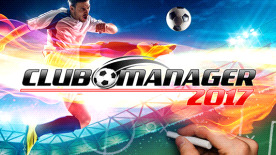 By fans, for fans: Club Manager is developed by fans with more than 20 years of experience and a passion for football. Merchandising : Purchases can now be made throughout the entire season. Kit Designer : There are now 20 designs available. The colour of each club's shorts and socks can now be selected individually.